EAST CHICAGO — The stage gets bigger, the lights get brighter and the boys turn into men. Tickets to the 78th Annual IHSAA Wrestling State Finals are on the line this Saturday as wrestlers from area schools will compete in semi-state tournaments at East Chicago and New Haven. Wawasee leads local teams with three qualifiers heading to East Chicago, along with two each from Warsaw and Triton. Meanwhile, Whitko’s Dillon Alma will fight for his state berth at New Haven. The regional round was a “win and you’re in” scenario where wrestlers winning their first match punched their ticket to semi-state. This weekend grapplers must win their first two matches to make it to state. “The biggest challenge this week is knowing that it’s the hardest semi-state in the entire state, bar none, for individual wrestlers,” explained Triton head coach Ron Brown. 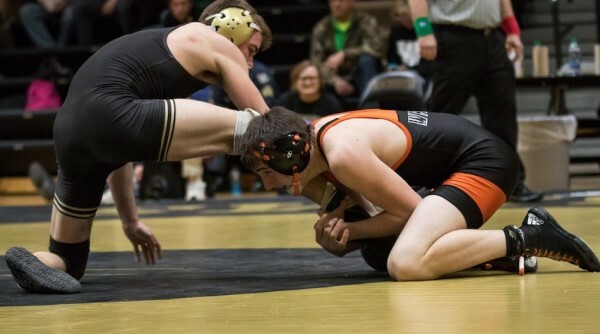 Brown’s team will be represented by Malachi Greene and Gage Waddle, both of which placed third in their respective brackets at the Rochester Regional. Greene (34-6) will start his day against Valparaiso’s Ian Dembowski (29-11). In the second round Greene would face either Jonathon Ragan (28-8) of Delphi or one of the bracket’s top seeds in Jeremiah Reitz (30-2) of Griffith. Waddle (37-3) will be favored in his first against Drake Guerrero (20-15) or Portage. Waddle’s ticket round match would be against either Crown Point’s Oszkar Kasch (30-2) or West Central’s Jaxon Mayhew (41-8). Kyle Hatch and Andrew Brock will be the lone representatives for the Tigers at East Chicago this weekend. Hatch comes in boasting a 39-0 record, the only unscathed record in his class. The junior will start his journey in the 138-pound bracket against Tristan Pintor (25-14) of Lake Central. The ticket round matchup for Hatch would include either Valpo’s Tristan Dembowski (34-6) or Myles Krintz (43-9) of Harrison. Daylan Schurg (34-1) of Crown Point, Munster’s Jason Cary (33-1) and Benton Central’s Cole Lukaszka (40-5) join Hatch as the top seeds at 138. Brock (32-10) returns to the semi-state tournament after a third place finish in the 220-pound bracket at Rochester. The senior will challenge Hammond Morton’s Seth Rincon (22-14) to begin his day. A win would pit Brock against the unlikely qualifier Kyle Simpkins (11-30) of LaPorte or one of the bracket’s top seeds, Donnie Crider (48-3) out of Harrison. “You’ve got to win your first two rounds to qualify for state,” said Warsaw head coach Justin Smith. “That make it tougher right of the bat. If you’re a one seed coming out of the regional, you’ll wrestle a four from another regional but then you’ll probably get a two seed in that second round. That ticket round at semi-state is a bear. 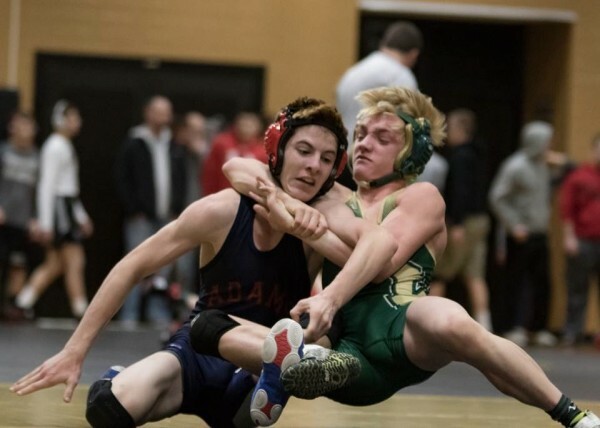 A year of resurgence for a storied Warrior program has come down to three remaining wrestlers, Tristin Ponsler, Jeremiah Dilley and Braxton Alexander. Ponsler had a tough showing at the regional, losing in overtime in the semi-finals. The mistakes that led to that loss should only fuel the senior as he enters the 132-pound bracket with a good shot at making it to state. Ponsler (33-4) will face Denver Smith (31-13) of Kankakee Valley to start his day. A ticket round tilt would pit Ponsler against Brendan Black (30-1) of Hobart or Kirkland Bushong (33-11) of West Central. Junior Jeremiah Dilley has had an excellent postseason, surprising some with his journey to this point. Dilley (21-16) will have his work cut out for him from the get-go by facing one of the top seeds at 195 in Evan Larsen (32-1) of Hanover Central. In the ticket round Dilley would face either Diamante Noble (22-11) of Hammond Morton or Chris Kidwell (23-1) of West Lafayette. Braxton Alexander, a freshman, will start his day at 113 with Valpo’s Austin Line (34-8). Alexander (31-6) would face either Portage’s Colin Poynter (29-8) or Josh Wade (38-13) of Harrison in the second round. Dillon Alma defied some odds at last week’s regional to get to this point and will look to keep surprising. Alma has earned a 27-15 record this season wrestling at 170 pounds. The junior will start his day with one of the bracket’s top seeds in Bellmont’s Bryce Baumgartner who is 36-1. A ticket round match would have Alma against either Tykease Baker (26-15) of Elkhart Central or Kokomo’s DaShaun Barbary (40-7).